Black Friday and Cyber Monday (BFCM) are coming on 23 and 26 November. What does that mean for marketers outside of the USA? Quite a lot, actually. 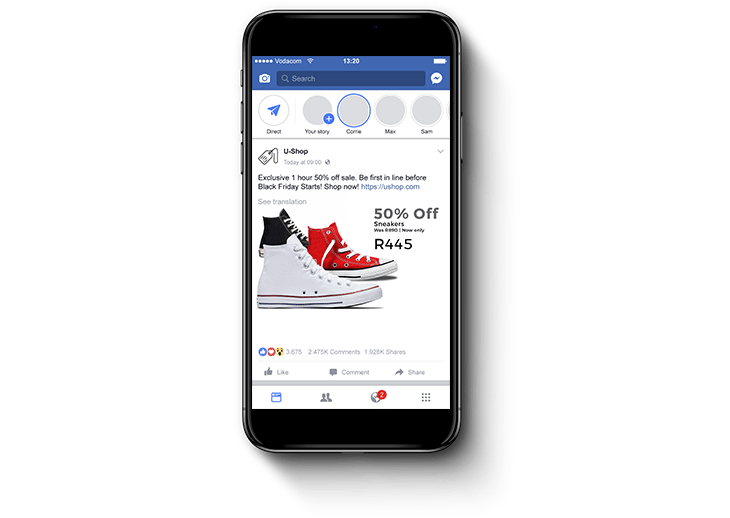 In the last few years, the shopping frenzy has made its way to South African shores, and businesses are seeing a notable impact. For example, in the month leading up to BFCM 2017, we sent 25.3 million emails with ‘Black Friday’ or ‘Cyber Monday’ in the subject line. On Black Friday and Cyber Monday specifically, we sent 35.3 million. It’s big. The first step to getting BFCM ready is to make sure your infrastructure is prepared for it. For instance, Shopify proposes getting your store, inventory, shipping, and customer service facilities ready for a surge in sales and an increase in traffic. Because if that fails on the day, it won’t matter what you decide to do with your marketing campaign. Don’t know where to start? 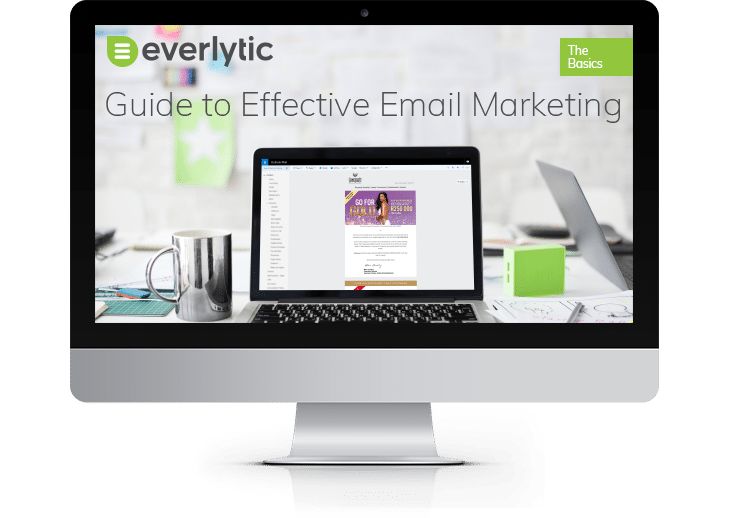 Download Everlytic’s Guide to Effective Email Marketing, our Guide to Inbound Marketing, and read our blog post on how to hyper-personalise your messages. It’ll give you the foundations you need to understand how and why to communicate personally with different audiences. Your clients will be bombarded with multiple sales and big BFCM deals. Make sure yours stand out by offering something that your clients can’t resist. If you don’t know of something off hand, analyse previous sales records and campaigns to see what worked. If you segment your campaigns according to factors like location, previous orders, or demographics, you can even market specific deals to certain audiences; sending the most effective deals to the people most likely to buy them. Limited stock: This is where you track your stock levels of certain products, keeping customers informed of your inventory levels. Flash sales: This is essentially what BFCM is all about – offering the sale on certain dates and at certain times. You can take this a step further by releasing a new sale item every hour for only that one hour. Partner this with a countdown clock and you’ll drive impulse buys. Calls to action: This is a line of text or a button (like ‘Buy Now’) that prompts buyers to act immediately. They work best when partnered with one or both of the above tactics. For example: In 2017, @Home ran a Black Friday campaign that collected new subscribers on social media with the teaser, “Your VIP pass to shop Black Friday. 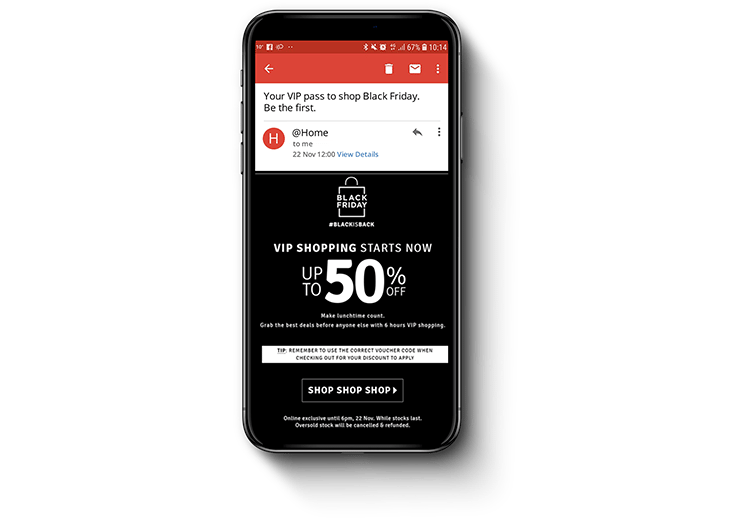 Be the first.” From there, they sent these subscribers an email granting them VIP access to Black Friday deals six hours before being released to the public; a shopping experience that increased sales by 110% on the day. One of your audience’s first interactions with your sale will be through an email subject line – the make-or-break first impression of your campaign. High-opening subject lines often ask a question, offer a tempting deal, or are personalised with the reader’s name or location. It can also help to test two different subject lines with A/B Testing, so you can send the one that performs better. If you segment your list (which we highly recommend), you can make them more and more relevant to each of your target audiences. 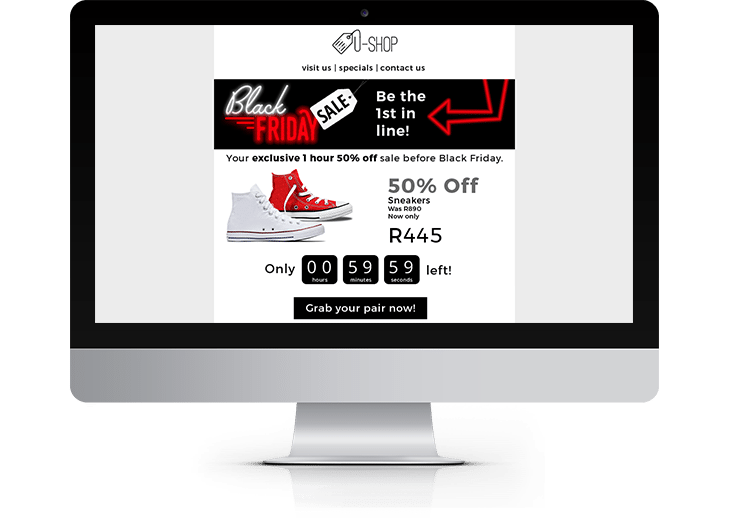 For Black Friday mails, Shopify recommends using the words ‘Black Friday’ or ‘Cyber Monday’ in the subject line, so your readers know that you’ve got something to offer. You’ll have to be clever with how you use it though, as there’ll be many Black Friday campaigns going to people’s inboxes during that time. The best campaigns don’t just say things well – they look great too. If you don’t have the budget or expertise to get your graphics designed by a professional, try using the wealth of online image resources and software available, like Shutterstock, Pexels, and Canva. You can then use these images across all your marketing channels, including email, your website, landing pages, and social media. Explain your deals clearly and make the terms obvious. We don’t mean writing it in print so small that no one can read or find them either – keep your clients informed of all the factors that go with the sale and you’ll avoid a lot of customer service issues down the line. If all goes well, you’ll be inundated with sales on BFCM. Automate everything, so you have as much mental capacity and physical agility available to deal with any issues that come up. With email automation software like Everlytic available, you can run seamless and intelligent email and SMS workflows easily. Social media should be a solid part of any marketing campaign. Burn the Book suggests tying your graphics to your website, email, and other sale material. This ensures consistency and makes sure that however your clients engage with you, they all recognise the brand. Social media is also a great resource growing your subscriber base – like with @Home’s 2017 Black Friday campaign. Their social media teaser allowed them to gather 5,000 email addresses! Plus, it’s often used as a customer service platform. So, make sure that someone is always monitoring it. And remember: social media is like a mini website – make sure the images you use on these channels are the same quality as the ones you’d use on your actual website. No one says you only have to offer deals on Black Friday and Cyber Monday. Many companies surprise their clients with extended sales beyond these days too. Makro, for instance, made a whole weekend of it in 2016. Several other local companies extended their 2017 Cyber Monday sales to Tuesday and beyond too. These unexpected sale extensions give undecided customers and those who didn’t get a chance to buy on the day (or even those who did) a little nudge to get off the fence. If you haven’t started your BFCM campaign planning yet, get on it. There’s lots to do. For more tips and ideas, visit Printful’s Holiday Marketing Guide; they’ve gone into great depth on how to manage campaigns like Black Friday.